This USB 3.1 card lets you add one USB-Câ„¢ port and one USB-A port to your computer, through a PCI Express slot. It enables you to upgrade your current system by adding two USB 3.1 Gen 2 ports to your computer and giving you access to data transfer speeds up to 10Gbps per port. By adding 10Gbps USB ports to your computer, you can harness the speed of USB 3.1 Gen 2 and rest assured youâ€™re ready for both current and future high-bandwidth USB-A and USB-C devices. Connecting older peripherals isnâ€™t a problem. This versatile dual-port USB 3.1 card is backward compatible with legacy USB 3.0/2.0 devices that use the common USB Type-A port, so you can eliminate the added expense and aggravation of purchasing new devices. You can also connect older devices on the USB Type-Câ„¢ port using a variety of USB-C cables and adapters. The USB 3.1 card is compatible with a broad range of WindowsÂ® and LinuxÂ® operating systems. 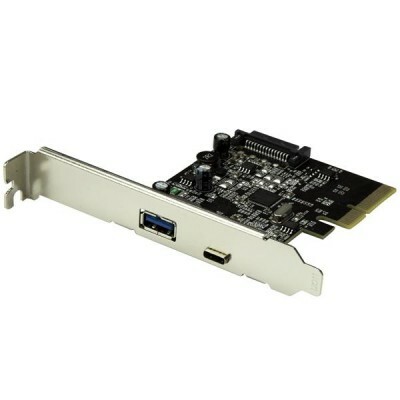 Plus, the high-quality card includes both standard-profile and low-profile brackets, making it easy to install in full or small form-factor PCs and servers. The PEXUSB311AC2 is backed by a StarTech.com 2-year warranty and free lifetime technical support.